Manchester United fans have taken to Twitter to vent their anger at Jose Mourinho after Marcus Rashford starred for England in the pre-World Cup game against Costa Rica at Elland Road on Thursday night. The United youngster, who struggled for consistency at Old Trafford in 2017-18, looked very sharp playing for The Three Lions, which was a far cry from his stifled performances for United. He looked free from defensive responsibilities that Jose normally places on him, and offered a timely reminder to United fans of his undoubted quality. Rashford played alongside Jamie Vardy upfront and looked very sharp, scoring the first that smacked of brilliance all over. On the 13th minute, he took the ball from Loftus-Cheek, and from absolutely nothing, dipped the ball with power from 25 yards to leave Costa Rica goalie, Keylor Navas rooted. The Real Madrid shotstopper looked shocked and a little embarrassed. He also had a hand in the second, playing the ball for substitute, Dele Alli who put in a cross to the far post for Danny Welbeck to head home on the 76th minute. Here are some of the best tweets about his performances. #mufc #mourinhoout ‘dazzled from the start’ ‘man of the match’ ‘excelled in general play’ … today’s descriptions of Rashford when he’s not playing for Bourinho! 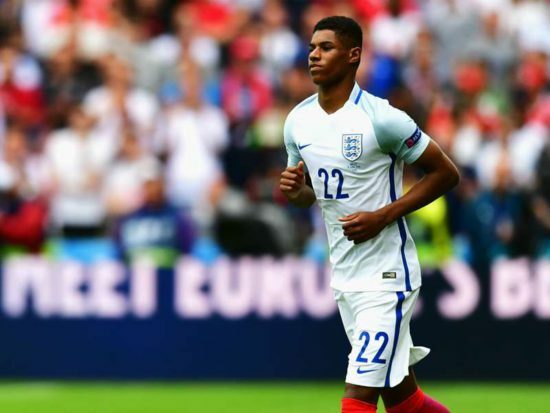 Fans noticed the difference between the Rashford that plays for United and England; the central role he was given for the Three Lions handed him more creative freedom. At United, Mourinho rarely ventures away from the 4-2-3-1 and Rashford only ever plays on the left wing. Because he’s right-footed and a striker by trade, he always wants to cut inside from that position but a combination of the condensed space in central areas as well as the absence of an attacking, left-footed left-back means he often ran into traffic. For England, the wing-back system allows attacking players the freedom they require and for that Gareth Southgate deserves great credit. There have been talks about the 20-year-old leaving United this summer on loan to get more first team action, though if he has a good individual tournament in Russia, he could make a case for more games next term and in his preferred position.